Last week I mentioned my “no beer” diet. Suffice to say that it is going very well, although I’m certainly not enjoying myself. I used to love having a couple of beers, a big snack (ie another meal) while watching tv. Now I can’t do that. You just don’t appreciate the things that truly matter until they are gone! 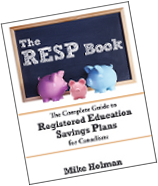 In other news, The RESP Book is on order at the Toronto Public Library. I don’t know when it will become available, but you can place a hold if you wish. Sustainable Personal Finance wrote a pretty good post about how his mom used to save money when he was a kid. Check out Mom knows best. Ellen Roseman from the Toronto Star warns about the dangers of pooled or scholarship RESP plans. Those people didn’t read my book! Flexo from Consumerism Commentary quit his job recently and says he should have done it a long time ago. Very inspiring! Canadian Mortgage Trends reports on mortgages that pay trailers to mortgage brokers. I think this is bad news – mortgage brokers are supposed to be unbiased, and this kind of compensation turns them into mutual fund salespersons. Jim Yih wrote about how TFSAs won’t replace RRSPs for retirement savings. Squawkfox clucked about stretching an oven baked whole chicken. Once I hit my target weight, I’m going to eat an entire chicken. Eric Reguly of the Globe says that Greece should just default and get it over with. Boomer and Echo wrote about the psychology of investing. My Own Advisor wrote a book review on “The Single Best Investment“. I’ll give you a clue – it has something to do with dividends. Before You Invest goes over all the RRSP rules. Janet McFarland from the Globe says that Canada needs a national securities regulator. Couldn’t agree more. Canadian Couch Potato is doing an excellent series on Debunking dividend investing myths. Canadian Capitalist takes a look at the new Scotia iTrade US-friendly RRSP. Michael James has some good advice on How to find a financial advisor. Beating the Index warns Beware of tv talking heads. Don’t get your investment advice from tv. Million Dollar Journey explains the difference between Dollar cost averaging and dollar value averaging. Should You Own An International Real Estate Fund? Scottrade Review: $7 Trades and Local Offices – While they may not be the cheapest discount broker, Scottrade does have an upper hand when it comes to customer support and local branch offices. Creating a Financial Plan for Free – Wealth Pilgrim explains how you can create your own financial plan easily and for free. TurboTax Online Tax Software 2010 Review – TurboTax is still the industry standard for tax prep software. See why. The Best Travel Rewards Credit Cards – Find a travel rewards card that best fits your spending habits. Reverse Mortgage Disadvantages – How to talk Grandma out of one of the potentially worst financial decisions she could make. Minimum Income to File Taxes – How to determine if you need to file a tax return. 15 Ways to Make Money — 15 ideas to help you make more money in 2011 at Moolanomy. I feared the same thing about trailers for mortgage brokers. I don’t see how this could be good for consumers. Thanks for the mention. Thanks a ton for the mention Mike! I didn’t think the article got much attention whatsoever as there weren’t too many comments on it. The best stories are true ones! Cheers! Thanks for the mention, Mike, and good luck with the diet. Call me when you get that chicken and I’ll drop by with a case of beer. In all seriousness, that’s pretty alarming for the industry, especially for consumers. I wonder what the kick-back for pushing the 5 year fixed rate is? I think only 20% of Canadians were taking advantage of variable rates over the past few years. Thanks for the mention Mike, how about some baby carrots for a second meal while watching TV? keeps the mouth busy and it’s healthier. That’s what we’re trying to do these days to cut down on chips. I didn’t comment on this earlier, but no beer? You’re certainly tougher than I, besides, how else am I going to maintain this attractive belly of mine, it takes lots of work! About the beer, good work, I understand, but at least buy some 0.5’s if you have to – come’on, Sunday is football day!? Hey Mike, great blog. Interesting that some banks are offering trailer fees and this may influence our mortgage sales pitch. I have yet to sell a trailer-fee mortgage to a client. The fact is that Merix is only one of two or three lenders that offer trailer fees and their rates are always great, so it’s hard NOT to sell these guys. That being said, pigs will fly before major big5 banks offer trailer fees to mortgage agents like myself so I continue to act on the best interests of the client.